« Another Step to Singapore and Brunei Merger? I don’t need Donald Trump to tell me that Obama’s long form birth certificate is a forgery (although I do appreciate Trump’s saying it). The image of Obama’s long-form birth certificate was reconstructed from layers of images—not just a simple scan or photograph of the document. If you have something like Adobe Photoshop, you can work with layers to construct realistic new images. You can have, for instance, an image of a person, and an image of the White House. Using Photoshop, you can move the image of the person over the image of the White House. You then have an image of the person supposedly standing in front of the White House. The resultant picture would have two layers—the layer on top being the person, and the layer on the bottom being the White House. I have done this type of thing many times for my kids who enjoy the fun. Obama’s long-form birth certificate was put out by the White House in what is called a PDF file—something you can open and view with Adobe Acrobat, but which you can also view with Photoshop. 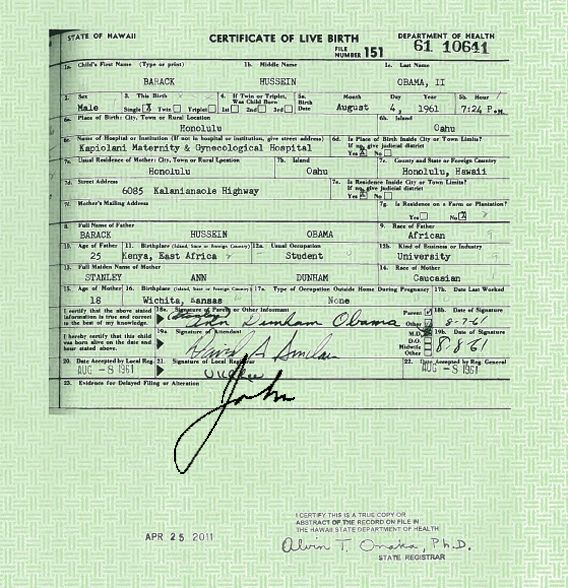 I have to admit, I did think it was strange that Obama’s long-form birth certificate was published on the background of Hawaii’s Certificate of Live Birth. 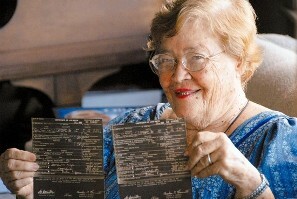 I expected a simple black and white image, like the other long form birth certificates from Hawaii. I never knew that a photo or image in a PDF file could have layers, so I decided to test Obama’s long-form birth certificate PDF. I opened Obama’s long-form PDF in Adobe Acrobat 8 Professional, just as an experiment. I right clicked over the PDF, and guess what-there were layers! Since I’m no expert, I couldn’t extract all the layers. I could only get two of them, but that was enough for me. Now I agree with those that say Obama’s long-form PDF was built up as layers. It was not just a simple image. Putting it on the green and white background that belonged to the certificate of live birth was just a way to hide any seams between the layers. Normally the certificate of live birth would be black and white. All they needed to do was take a photo of Obama’s original long form birth certificate and show that to the public. Obviously, for some reason, they could not do that. Just to show you what can be done, here is a copy of Obama’s long form PDF signed by me at the bottom – JOHN. It is so easy, that, with the proper software your kids could do it, and join in the signing of Obama’s long form birth certificate! What Obama’s forger(s) should have done would have been to flatten the layers into a single layer. On photoshop all you have to do is check a box, and the image is “flattened” into a single layer. Then there would be no way to detect that Obama’s long form birth certificate was cobbled together from various images. Obama’s forgers could have done a better job. Forgery is a serious felony and a forgery conviction can result in up to ten years in prison, heavy fines, and more. Hopefully, this crime will not go unpunished. Realistically, it’s not likely that the perpetrator will be brought to justice. I would have thought that if that is the case, and indeed a strong case, surely you or any US citizen can bring up the matter to court! And let the court make a decision. And America is a nation ruled by law. So why haven’t any of these people done so? Is America really ruled by law? I don’t think so – at least not when it comes to the powerful. “Is America really ruled by law? I don’t think so – at least not when it comes to the powerful.”, admin. It is the case as well anywhere else, so what happened in Libya, Iraq, Afganistan, Egypt etc politically and socially can happen to US too. Well, it means the people may take on the Authority when they have to or forced to. I often wondered how Obama put himself thru’ Occidental college? Who financed him? He is worse than Bush, spending more of our money!He’s sent more troops to Afghanistan. He hasn’t created jobs. He’s done nothing for our country. Now, I definitely know that he’s not born in America. Thanks for the revelation John! But the Republicans have no guts to do anything either. You are really late to the game. Lots of people pointed these out and yet even Fox News couldn’t find a way to blow it up beyond the usual veiled insinuations. That’s because those are not proof of forgery but rather a demonstration of the retarded way in which government workers digitize old documents. Sorry, Anon, but you are the one who is late in the game. Scanning does not produce multiple layers. Those happen only when scanned documents are altered. Suggest you catch up on technology. Seriously, you could not be more wrong. Yawn, if over 2000 years are not enough to debunk the myth of the birth of Jesus then the birthers will certainly not let go of the birth certificate forgery myth even if The Donald himself has admitted he was wrong. 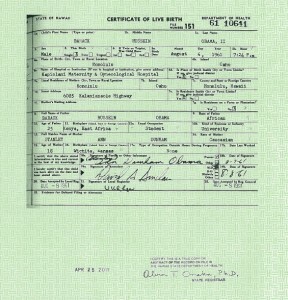 The fact that Obama’s birth certificate is a forgery, and has been altered has been proven. The birth of Jesus or his bodily ascension into heaven has not been proven so far as I know. 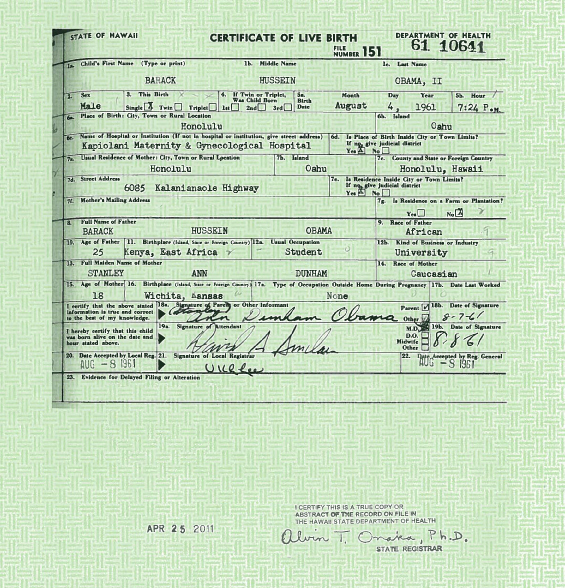 The only implication that one can draw from Obama’s forged birth certificate, is that there was something to hide. Whatever that may be I have absolutely no idea. 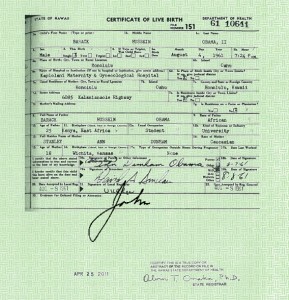 I wrote in another post that his supposed Kenyan birth certificate was most likely a fake, so I have not taken sides – only looked at Obama’s birth certificate from a technical point of view. I seriously doubt that whether or not Obama gets re-elected will have any effect on change in America. All recent US Presidents have been the same, and the past is prologue to the future.